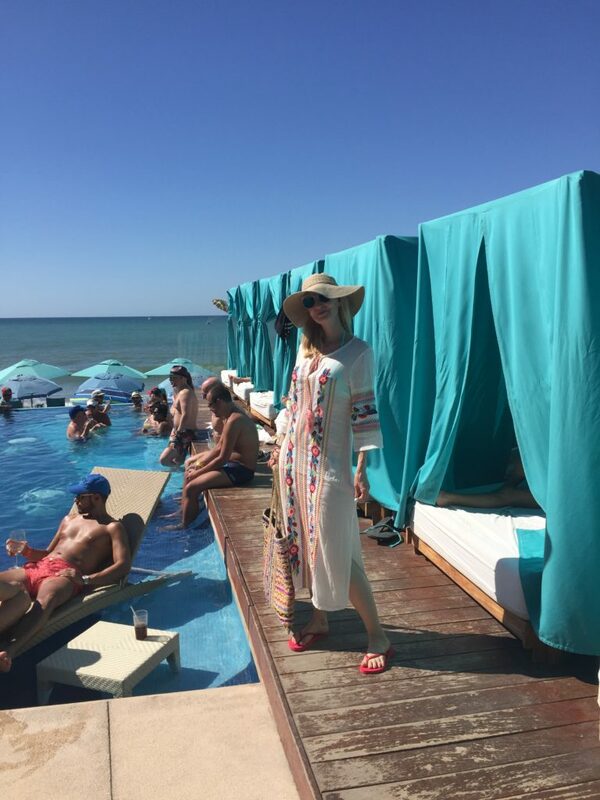 One question that I hear a lot is how to rock a poolside or beach look over 40. I’m all about the kaftan trend right now! You can look beachy, cool, and still have some coverage. Of course let me say that I’m all for you wearing whatever you want and feel comfortable in. In the pool, I wore a bikini and if it scared anyone well … sorry, not sorry! But for the snack bar, cabana, tiki bar, etc. I was all about this cotton embroidered kaftan. And update on my coffee-stained lap top. It’s now soaking in a bin of rice, for goodness sake. Fingers crossed that I will have it back working again soon, but it the meantime, I’m borrowing the hub’s computer when I can. And if doesn’t have any of my stuff on it, which is so frustrating! Link Ups:Visible Monday! Shoe and Tell! #iwillwearwhatilike link up! Hello Monday! Mix It Monday! How I Summer! Creative Mondays! Let It Shine! A Lovely A La Mode Link Up! Sincerely Jenna Marie! Turning Heads Tuesday! Confident Tuesday! Bloggers Who Inspired Me! Tuesday Fashion Party On Trend Tuesday! Style Perspectives! Trendy Wednesday! What I Wore! The Wednesday Pants! Tucker Up! Jersey Girl Texan Heart! Pumps and Pushups! Color and Grace! Thursday Moda! Thursday Fashion Files! Labour of Fashion! Thursday Favorite Things! Thursday Moda! Top of the World Style! Welcome to the Weekend! Passion for Fashion! Fabulous Friday! Fab Favorites! Friday Favorites! Link Party with Osy! Flashback Fashion Fridays! Weekend Wear Link Up! Sheela Writes! Edge of the Week! Nancy’s Fashion Style! Celebrating Style! You look smashing in that cover up, Dawn!! I always thought that rice trick was a myth? You’ll have to tell us if it really works!! Good luck! Well, the guy at the Apple store said it really works, but for me … I will be computer shopping this weekend! Oh I know that feeling, my computer died and I gained a new one with my hubbys hand me down! Fortunatley he had a nicer one, but I had to move all of my stuff over. You look great in this Kaftan cover up, and I wear a bikini too. heck ya friend! THis cabana pool area looks amazing! This kaftan is gorgeous!! the pool and cabana looks unbelievable!! I hope your laptop is doing better, you know my tea saga from two weeks ago! haha I LOVE your poolside look. Tres chic!!! I thought of you and your saga right away! And I too will be computer shopping! Oh well!